Warehouse Location Labels create order and efficiency within a warehouse. 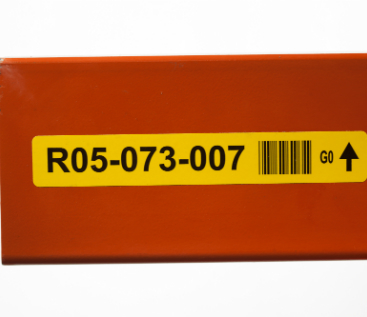 Location labels provide high visibility and permanently identify racks and shelving units, preventing mis-shipments and inaccurate inventory counts. Available in several versions to deliver specific nameplate solutions, they come in a variety of mil thicknesses and sizes to suit any application or budget. 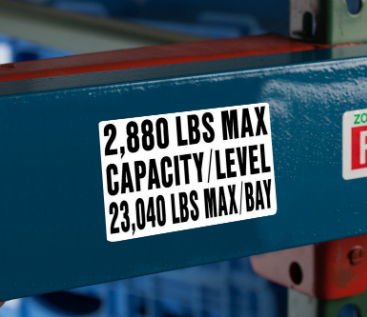 Weight Capacity Labels increase warehouse safety by ensuring workers and forklift operators are loading the racks properly. By not having labels properly displayed, the racks could be overloaded and cause a failure. Be sure to comply with your rack manufacturer for capacity ratings. Organize receiving, stocking, staging, inventory, picking and shipping operations. Eliminate the uncertainty of which rack to scan. Customized for sequential numbering, providing multiple options for companies to organize assets integral to their operations. Provide maximum load safety warning on all racks & shelves. 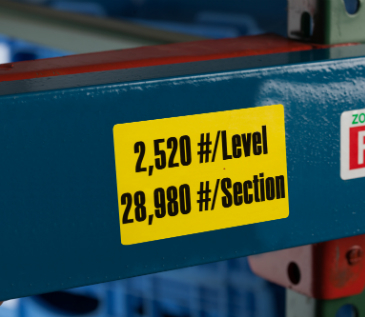 Weight capacity labels protect employees from hazards in the workplace. Can be customized to virtually any size, color and/or graphics. Print with barcode, sequential number and/or human readable identification. A variety of adhesives for indoor, outdoor and cold storage label applications.